The garden of five senses is not just a park. it is a space designed to stimulate one's sensory response to the environment. an ambitious project of Delhi tourism the garden is a 20 acre spectacular beautiful site designed as a public leisure area close to the ancient village off Said-ul-Ajaib near the historic heritage area of Mehrauli, Qutub Minar the awe inspiring India's highest single tower and a world heritage monument, is in its close proximity. 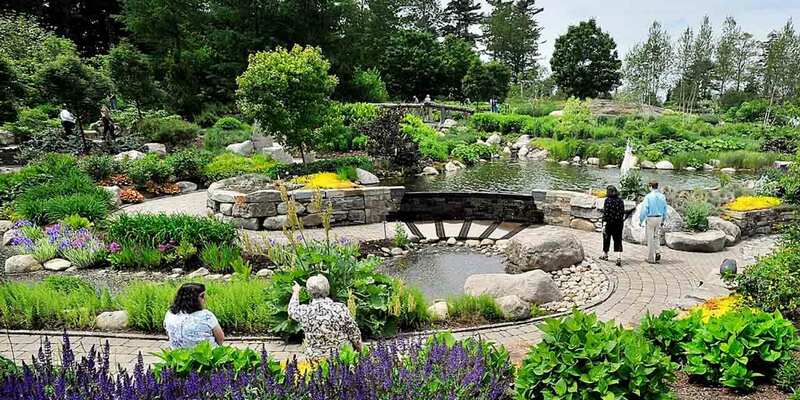 The garden was inaugurated in 2003 and has been very popular ever since. A garden in Delhi seeks to provide a soothing antidote to the hustle bustle of the capital city. Living in the capital city of Delhi is already a true wakening of the senses. These is a riot of color, noise, touch, taste and smell. The garden of five sense in Delhi is a place to unwind and revel in the gift of the senses and to recharge one self. The place appeals to all the five senses in a measured manner to provide a balm to the frenzied mind. An amalgamation of color and fragrance, texture and form evokes the awareness of touch, smell, sight, sound and taste. Emphasis is on the natural, the sounds of nature are accentuated by carefully selected music, the rocky terrain invites you to touch, the fragrant shrubs and herbs stimulates the smell and food courts please the tongue. The Garden of Five Senses is a celebration of aesthetic expression and appreciation, a seamless dialogue between the creations of the man and nature that invites interaction and exploration and in doing so reaffirms the essential sensual nature of man. The entry to the Garden of Five Senses is through a gateway of soaring stainless steel birds mounted on state clad pillars. This is the work of a contemporary Indian artist - Subodh Kerkar. The contrast between the rough state clad pillars, the soft greenery and the shining birds is striking. Close by the name of the park is engraved in 52 Indian and International Languages. A plaza at the entrance of the garden acts as buffer between main road and the garden proper. Low walls composed of Pink Sandstone, Golden Yellow Jaisalmer Stone and Pale Pink Dholpur Sandstone are piled together. The walls have a lot of Mughal architecture and influence. The garden is visible from the plaza through a magnificent stone wall built by Rajasthan craftsman using stones from Jodhpur, Jaisalmer and Dholpur. As one enters the garden complex, an expansive plaza set on natural slope of the site, invites you to explore a spiral walk way. A precession of monumental pink sandstone elephants carved on site by sculptor from neighbouring state of Rajasthan are part of the entrance plaza. This is dominated by a dramatically paved spiral walk way and gently sloping lawns interspersed with terracotta pots each more than seven feet tall. When the visitors descend the spiral walkway, they are treated to the court of plants. The court of plants pay homage to exotic flora imported from all across the world and also indigenous species. There are more than 250 plants species that are showcased, from the commonly used varieties to exotic plans. Some of the varieties that can be found the Garden are Kalpataru, Kamandal Tree, Reethe, Brinjal Plants, Lipstic Tree, Varandava, Champa, Calophyllum, Camphor, Bismarkia, Palm, Ficus Krishnae etc. The local existing vegetation is also preserved carefully to add character to the garden. The Garden of Five Senses is one of the largest commissions of public art in the country.. The artists represent amalgamation of modern and traditional, established masters and young artists. Featured are some remarkable terracotta pots by master crafts person Angoori Devi and Giri Raj. Artist Giri Raj has executed a large Phad wall hanging at the entrance. Most of the works of art are however contemporary. They include works of M.J.Enaj, Subodh Kerkar, K.S.Radhakrishnan, Kristine Michael, Ratna Bali Kant and British sculptor John Bowman who has been living in India for more than 20 years. In addition there are also a large number of works of students from Delhi College of Art. Amongst the innumerable marvelous pieces of architecture some that need a special mention are a Fountain tree sculpture in bronze by Indian based sculptor Bowman, ceramic windchime by ceramist Michael. This towering piece with delicate metal spirals, holds hundreds of hand beaten chopper bells that tinkle in the slightest breeze, the most stunning of the is Indian artist Enaz’s “A new heaven, a new earth’, a gigantic sculpture of a man holding a loft of woman artwheeling. Radha Krishnan’s “Heritage Column” is another not to be missed sight. Sculptured in the garden use many different media, like there is a bronze sculpture, set called Five Senses through Five seasons by artist Ratnabali Kant. White figures of praying children is a piece of work, “Prayer for Peace” by Kamal Narayan. The inspirational architecture of the Garden of Five Senses is influenced by the diverse Indian cultural traditions. The garden has been divided into special zones. The Khas Bagh is build on the lines of Mughal Garden. The garden is characterized by slow moving water cascades that represent four mythic rivers that flow out in the four conditional directors. The traditional idea has been interpreted in a contemporary fashion with the central axes punctuated by a series of fountains. The color garden are essentially narrow pathways made of various natural materials depicting a composition in colors lined by flowering shrubs and ground covers that complement each other. Here space terraced beds hold plants and flowering shrubs. The common lantana displays itself is at its best when it depends on the plant for food. Water lilies add color to the meandering pool in Neel Bagh. Metal Pergolas add a formal touch and their cured roofs echo the contours of the water body in this part of the garden. At the centre of the court is a stunning wind chime crafts by Ceramist Kristene Michael. Originally the sculpture held beautiful blue ceramic bells, attuning to the color blue of the water in this part of the garden. However due to high winds the ceramic bells were constantly breaking and were replaced by metal bells. The court of Bamboo with its graceful arches and pillars showcased a variety of bamboo plants. Every turn of the meandering path connecting various parts of the Garden of Five Senses offers a new vista. The Central plaza has a carefully landscaped appearance with intricate stone-paving contrast to fresh, soft greenery. The tactile area of Garden of Five Senses in Delhi is is very special and depicts material,textures and color that are specially designed to stimulate the sense of touch. Interesting features such as weather beater rocks from the banks of river Ganges having remarkable textures and colors are highlights. Other attractions are the court of palm, court of cactii, herbal gardens, tree museum, topiary gardens, zen gardens, aromatic gardens and butterfly zone. The Garden of Five Senses is young and still evolving, the growing specials of plants and trees are still filling spaces. The garden figured in the Limca Book of Records in 2004 for its unique concept of the Solar Energy Park. Delhi Tourism’s 3 day Garden Tourism Festival is held at Garden of Five Senses. Garden of Five Senses in Delhi is also available for hosting memorable events like birthday parties, picnics, gala events, pre & post wedding functions and corporate functions and is a preferred location for film shooting. The Garden of Five Senses is an invigorating space, a veritable playground for our senses. The blurring of the boundaries between the old and the new tradition and modernity, build and inbuilt in the garden is fascinating.